The first step is to understand that insurance is not an investment tool that could help save income tax but is imperative to cover you from risks. It is well known that India is grossly underinsured. Life insurance penetration, measured as a percentage of premiums to a country's gross domestic product, was just 3.1 per cent in 2013/14, compared to 11.7 per cent in Hong Kong and 8.8 per cent in the UK. This perennial problem, however, can cost us dear unless we, the common investor, understand the difference between insurance and investing and, more importantly, know the real benefits of the different types of insurance plans available in the market. Most people believe that they can save enough money to replace their assets, should anything happen to them. But problems arise in the event of the unforeseen - an accident, disability, or even death - derailing all the plans that one had followed so meticulously, even for the one who had a disciplined approach to saving. This is why life insurance must be an integral part of our overall financial plan. The first step, however, is to understand that insurance is not an investment tool that could help save income tax, but is imperative to cover you from risks. And, managing risks is all about addressing our life goals, and ensuring everything goes as planned for the rest of the family even if the earning member dies suddenly. What comes in our way, however, is: 'What if nothing happens to me? Does all that money I have paid as premium go down the drain?' At first look, it seems logical. And, that's one reason why most Indians stay away from pure term insurance policies - something, that financial experts say, is the most important chapter to secure the life of your loved ones - because these products do not give the policyholder any return on the amount paid as premium during his or her life time. But, consider this: For a 35-year-old, an annual premium of Rs 10,830 for 25 years can buy a life cover of Rs 1 crore, which can offer stability and meet the immediate needs of the family of the insured in the unfortunate event of his or her death. And, yes, if the person survives the 25-year term he or she loses the Rs 2.7 lakh paid as premium. However, considering the uncertainties that life is all about, if we ask ourselves: 'What if something happens to me? 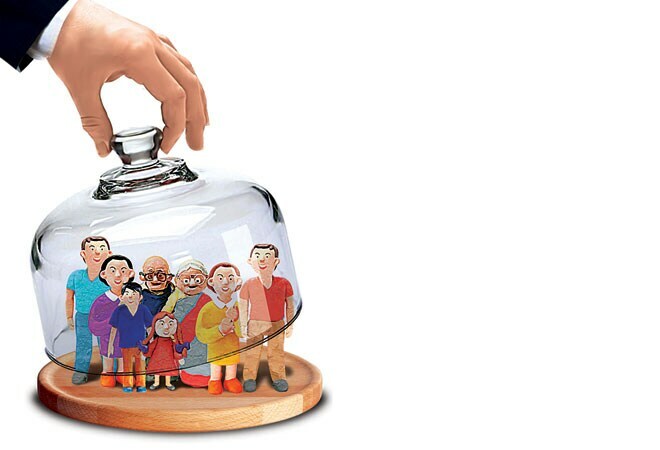 Will I be able to provide a financially secured life for my dependents?' The question may, all of a sudden, come as a revelation to most of us, more so for those who form the base of the financial pyramid. The bitter truth, in the Indian context, however, is that the rich, in spite of a financially secured life, are more adept to taking to insurance, compared to the not-so-moneyed. And, this must change. Fortunately for us, the government is also trying to raise awareness by offering various schemes and taking steps to bring it to your doorsteps. Here, we will give you a sneak-peak into why it is the right time to take advantage of the activities in the insurance space by both the public and private players. Term plans: Term insurance plans are pure protection plans which pay the sum assured on death of the policyholder. They are cheaper by 50-60 per cent when bought online. The rates, however, vary according to the policyholder's age and lifestyle habits. For example, smokers will have to pay a significantly higher premium compared to that of a non-smoker. Unit-linked Insurance Plans (Ulips): Ulips had caused a major financial drain to investors during the 2000s leaving many feeling betrayed. However, after 2010, with a change in rules suggested by the regulator, the Securities and Exchange Board of India, unit-linked plans have not only become more cost-effective, but provide you with the perfect platform to launch your life insurance needs. Online distribution has sharply reduced acquisition and maintenance costs as well, so much so that there are some Ulips whose costs are lower than that of mutual funds. For instance, if a 30-year-old man invests Rs 50,000 every year in Aviva's i-Growth plan, the corpus will grow to around Rs 13 lakh in 15 years, assuming an 8 per cent annualised rate of return. If the same amount is invested in a five-star rated large- and mid-cap fund, the corpus would work out to around Rs 11 lakh in 15 years (at 8 per cent), considering the higher expense ratio of mutual funds at 2.6 per cent, compared to 1.29 per cent for Ulips. Some low-cost Ulips, according to policybazaar.com, an insurance comparison site, are Aviva i-Growth, Bajaj Allianz Future Gain, HDFC Life Click2Invest, HDFC Life ProGrowth Plus and Edelweiss Tokio Wealth Accumulation. Since charges are front-loaded, the benefits are more if you stay invested for a longer duration. Also, loyalty additions are generally added after eight to 10 years. Traditional plans: Traditional policies give a sum assured and a guaranteed or vested bonus at maturity. Such plans invest money in fixed income instruments and are for people who do not want to take a lot of risk. Several companies are also offering traditional plans online. In addition to the efforts of the life insurance companies, the central government, too, has been playing its part to sync the digital India programme with the evolving insurance space. It has launched three schemes, Pradhan Mantri Suraksha Bima Yojana, Pradhan Mantri Jeevan Jyoti Bima Yojana (PMJJBY) and Atal Pension Yojana (APY), to take insurance to the doorstep of the most vulnerable sections of the society using the digital platform. Private insurers have gone online to save costs and pass on the cost benefits to policyholders. India's massive subscriber base - of over 900 million mobile phone and 200 million internet users - has proved to be facilitator in this massive overhaul. Experts say term plan is one of the fastest growing segments online in the life insurance industry and insurers need to leverage this opportunity. "The digital platform plays a significant role in our business. Around 93 per cent of our new business applications are initiated using the online platform, 50 per cent renewal payments are made through the website or electronically, and 69 per cent service transactions are processed through website, SMS or IVRS," says Sandeep Batra, Executive Director, ICICI Prudential Life. According to a report by Boston Consulting Group and Google India, insurance sales from online channels will grow 20 times by 2020. Digitalisation has also improved offline sales. Says Batra: "Life insurance continues to be sold offline as it helps the customer to identify the appropriate insurance policy. The use of technology in the sales process has resulted in faster turnaround time." Almost 93 per cent of ICICI Prudential's sales in 2014/15 happened using the digital platform. It has also helped in reducing the grievance ratio significantly. You can now maintain your policies in digital form as well. This is much more convenient than keeping physical copies for years. It also gives you a platform to revise details electronically without any hassle. Says S.V. Ramanan, CEO, CAMS Repository Services: "In the interest of the policyholder, it is important they take advantage of this free-of-cost initiative to convert their policies into electronic format. We have seen people who have been impacted with natural calamities, such as in J&K and Assam, suffering, as the physical copies of their insurance policies were lost in the floods." We have also witnessed increased activity in the mobile application space where insurers are competing against each other to provide the consumer with an easy-to-use platform to connect even during the claims process. "At ICICI Prudential Life, we have a complete online process for claims settlement. This, in addition to the claims specialist, who handholds claimants through the entire process, stationed in each branch to ensure that genuine claims are settled in the shortest possible time," says Batra. Mobile apps also enable policyholders to directly access and modify all the necessary information about their policy, modify information, pay premium and even buy new policies. While the government and insurers join hands to provide you with the best of services, it is in your hand to secure your life and that of your loved ones. So, take the plunge and secure your financial lifeline.